South Korea's top nuclear envoy who recently attended working-level consultations between North Korea and the United States in Sweden said Wednesday that there will be "rapid progress" in efforts to stage more talks between Pyongyang and Washington. Lee Do-hoon, special representative for Korean Peninsula peace and security affairs at the Ministry of Foreign Affairs, was at a meeting in a suburb of Stockholm where North Korean Vice Foreign Minister Choe Son-hui and U.S. State Department Special Representative for North Korea Policy Stephen Biegun exchanged their ideas on denuclearization and lifting sanctions. "It went well," Lee said of the North Korea-U.S. meeting earlier this week. 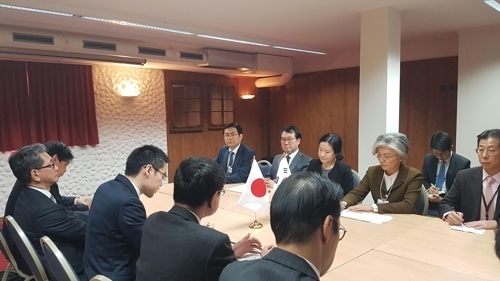 He was speaking to Yonhap News Agency after attending the meeting between South Korean Foreign Minister Kang Kyung-wha and her Japanese counterpart Taro Kono in Davos, Switzerland.